I haven’t read a decent serial killer novel in such a long time – mostly because I grew rather weary of the genre since there was a dearth of original specimens out there. Saul Black has succeeded in luring me back with this accomplished piece of writing which I devoured in one sitting. The chapters are short and succinct with lots of twists and turns to make this a really addictive read. The characters are true to life and the author takes care and time to let the reader know more about both the “goodies” and the “baddies” making them more than a means to an end. There’s a lot going on in this fast paced thriller with the main detective being victimised by someone unknown, a child witness to a murder unable to get to safety, a serial killer tiring of his sidekick. It’s a dark and disturbing tale but extremely entertaining at that…. strange but true! Poppet is Mo Hayder’s tenth novel and the sixth to feature D I Jack Caffrey but fear not, it works as a stand-alone novel as there is enough back story to inform the new reader without boring existing fans. I hadn’t read any of Mo Hayder’s crime thrillers until this one. Why? I guess I had read a lot of Karin Slaughter and Patricia Cornwell in my twenties and then experienced burn-out of this genre and perhaps motherhood made me shrink from the darker side of human nature. In any case, I was so intrigued by the cover of Poppet and glowing reviews via Twitter and Good Reads, that I decided to take the plunge. Most of the action takes place at a mental health unit where a spooky mythical creature, known as The Maude, seems to be the cause of a number of recent deaths and incidents. The lead nurse, AJ, tries his best to calm down the inmates and staff but the hysteria is rampant so he calls in D I Jack Caffrey to try and get to the root of the problem. Meanwhile, Jack has his own issues, trying to locate a missing person without implicating a fellow officer. 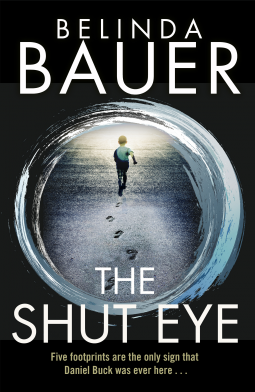 This is a cleverly plotted, sharply written, compelling thriller and one which, whilst spooking me, fell short of scaring me witless…a good thing in my book as I like to be able to sleep at night! Ideal holiday reading and I now have the delight of tracking down Mo Hayder’s back catalogue. Having thoroughly enjoyed Collusion, Stuart Neville’s second novel, I was thrilled to be offered the chance to review a proof copy of his third and latest novel, Stolen Souls and what a page-turner it is! Galya hoped for a new life in Ireland, a better life than her old existence in the Ukraine but she soon finds herself enmeshed in the grimy underworld of Belfast, on the run from Lithuanian gangsters. The man she thinks might save her has other plans for her “salvation” but she won’t give up without a fight. Meanwhile, Detective Inspector Jack Lennon (who featured in Neville’s first two books) hopes for a peaceful Christmas with his daughter but he too becomes caught up in a deadly race to save Galya from her predators. Stolen Souls is one of the most gripping reads I have ever read, I had to stay up until the wee hours of the morning to discover Galya and Lennon’s fate. Stuart Neville has the knack of drawing you in from the very first lines and keeping you in a headlock until the final pages. Like his other novels, the chapters are short and snappy, sweeping you like a whirlwind through the streets of Belfast – a Belfast not designed to appeal to tourists! Yes, it’s an extremely fast-paced narrative but the characters still stand out with the author somehow showing the human qualities of even the most grotesque and psychotic individuals. I particularly liked the back stories to the Lithuanian mobsters and Galya’s story – if they expected Belfast’s streets to be paved with gold, then they were sorely disappointed. Even our “hero”, Jack Lennon, has his flaws and recognises his double standards but you have to fight dirty in a police force mired in corruption. 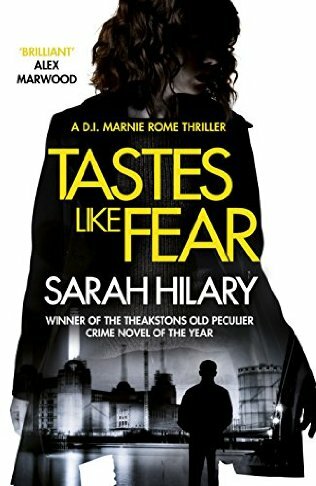 This is certainly not a novel for the faint-hearted – there’s blood, gore, mindless thuggery and violence with morality thin on the ground but if you can cope with all that you’re in for a treat with this unputdownable story. I certainly feel different walking along the streets of Belfast now! PS. In the New Year, I will hopefully be hosting a giveaway for several signed copies of the hardback edition. So watch out for it on the blog in January 2012. 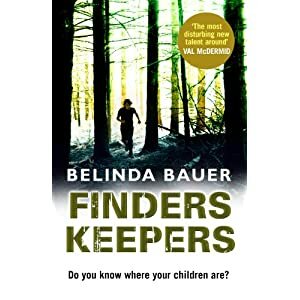 “Finders Keepers” is Belinda Bauer’s third novel and, like its predecessors, it is set in the tiny, picturesque village of Shipcott on Exmoor. It is the height of Summer and tourists usually swarm to this scenic location but children are going missing, stolen from cars and the local police force are out of their depth. This is a gripping read, not for the faint-hearted, with lots of twists and turns to keep the reader guessing. I really enjoyed Belinda Bauer’s debut novel, Blacklands, and she has a knack for creating atmospheric settings and interesting, believable characters. I was particularly engaged by Jonas Holly, the emotionally damaged policeman who is still reeling from the violent death of his wife. The teenager Stephen Lamb, himself traumatised by past events, doubts Jonas’ innocence – could he be behind the childrens’ disappearance? “Finders Keepers” can work as a stand-alone novel but the reader might have a more complete picture of Stephen and Jonas by reading the previous novels first. Another impressive, intelligent novel from a very talented writer – I’m looking forward to the next instalment, if Shipcott can stand any more excitement!! Former paramilitary killer Gerry Fegan wanders New York City, hiding from a past he escaped at terrible cost. But he made a fatal mistake: he spared the life of Bull O’Kane, a ruthless man who will stop at nothing to get his revenge. Too many witnesses survived a bloody battle at his border farm, and now he wants them silenced, whether man, woman or child. O’Kane calls the Traveller, an assassin without pity or remorse, a killer of the purest kind. Back in Belfast, Detective Inspector Jack Lennon, father of one the witnesses, is caught up in a web of official secrets and lies as he tries to uncover the whereabouts of his daughter. The closer he gets to the truth about the events on O’Kane’s border farm, the more his superiors instruct him to back off. When Fegan realises he can’t shake off the trail of violence that has followed him across the world, he has no choice but to return to Belfast and confront his past. The Traveller awaits Fegan’s return, ready for the fight of his life. My husband, the Lovely Bry reviewed Stuart Neville’s debut novel The Twelve here last year. Unfortunately I didn’t have the opportunity to read it as it was lent out to friends who lent it to other friends etc etc. However, this time I was determined not to miss out so as soon as Bry turned the last page I snatched the book and devoured it in just one day, taking time out only to see that the children were fed and watered – it was really unputdownable. 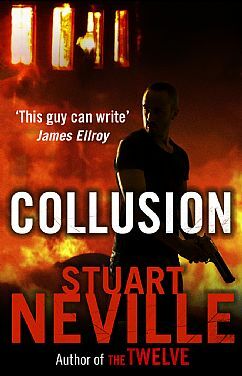 I have been assured by Bry that Collusion is an even better read than The Twelve and that you can see how Neville has improved his writing, tightening up the narrative, using short chapters which crank up the tension to an almost unbearable level. Gerry Fegan and the mysterious Traveller both have a slightly supernatural element about them – Gerry is still haunted by his turbulent past as a paramilitary killer but retains his aura of invincibility. Is The Traveller his nemesis? It’s not a clearcut case of good versus evil here as the baddies far outnumber the goodies and each character is fully fleshed, flaws and all. You really don’t know who to trust from one minute to the next. DI Jack Lennon is a really engaging character. He’d given up so much in order to join the police at a time when Catholic recruits were few and far between and now his once respected superiors seem enmeshed in the filthy mess of collusion – loyalists and republicans even helping each other if there’s money to be made. In short, a thrilling, taut read – not for those of a nervous disposition or those who object to “strong” language. I’m really looking forward to Stolen Souls, another thriller featuring Jack Lennon, somehow I don’t think he’s going to get the quiet life he’d hoped for! Four friends at an Ivy League college – one is found dead, frozen in the snow, having lain there for nine days – her disappearance is somehow overlooked by her bosom buddies. Spencer O’Malley, local police detective, is assigned to the case and is soon drawn into the web of deceit and secrets which ties the four students together. Further complications arise when it turns out that Spencer knew the victim. In this, Simons’ second novel, she creates a tight and suspenseful thriller peopled with mostly unsympathetic characters who lead elitist, over-privileged lives. Indeed, Spencer is possibly the only potentially likeable character although he sometimes strayed into cliched cop territory and did eventually grate on me! 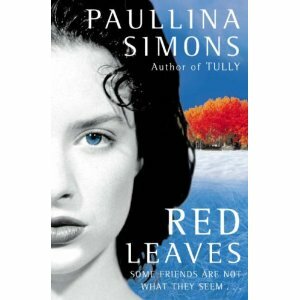 Overall, I enjoyed Red Leaves – I loved the college setting and the tight knit group of friends reminded me of the characters of Donna Tartt’s The Secret History, one of my all time favourite novels. The pace is a bit laboured and slow at the start but I found the second half gripping. I’ m looking forward to reading more from this author.